The Jubilee Year of the Bible is important to understand properly if you want to understand the Biblical Calendar, and with it Bible prophecy and what it holds for the future. But few people do. Some think it is 50 years, some 49 years. Find out the truth now. How do you pronounce God’s name? It is hotly debated. Opinions vary depending on the evidence used, mostly evidence external to the Bible such as results in the popular but wrong Yahweh “scholarly guess.” But based on the remaining unerased vowel points in the oldest complete manuscript of the Hebrew Bible, the Leningrad Codex, we can get the most close possible today without a prophet. Listen to a recording of it below. When is the Separation of the Sheep from the Goats? Is Global Warming real? Are greenhouse gasses causing it? More importantly Is it a real threat to our civilization as the movie The Day After and An Inconvenient Truth depict? Preterism holds that prophecies such as the destruction of Jerusalem, the Antichrist, the Great Tribulation, and the Day of the Lord were fulfilled AD 70 when the Roman general Titus sacked Jerusalem and destroyed the Jewish Temple. Can you see what’s wrong with this picture? Confirmation of the Covenant: Who are “He” and “the Many”? Which Christ confirms the covenant in Daniel 9:27 for seven years, Jesus or Antichrist? And who is this covenant made with that is only described as “the many?” Is it the Jews or someone else? If you want to understand Bible prophecy, you need to develop a certain mindset, the same mindset that self-made millionaires tend to possess. A lesson from history’s greatest fighter pilot and millionaires today illustrates it. Proponents of the traditional Jewish or Hillel II calendar raise many objections to the observed calendar used by the Karaites. In this article written by Dinah Ben Mordechai dozens of the most popular questions are answered. Is the Bible Code Real? 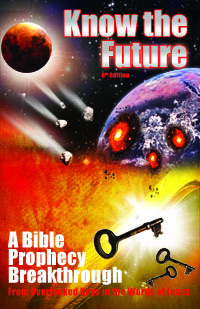 What about the “Bible codes?” Books like “The Bible Code” claim that they are real and allow the discovered to know the future. But are they really there or are they too subjectively forced? The answer is that there are some real ones but not as many as is claimed and they do not accomplish what is thought.